To become the safest company we can be. To conduct our work and our operations in a manner that protects every person potentially affected including you, our customers, our employees and the public. To value human life, health and welfare above all else. Our safety could potentially affect you, our client, as much or even more than it affects us. It’s critically important to you and to us. And for us, it’s a process; a never-ending journey of continuous improvement. Personal Behaviors – At A&A, we make it personal to make it stick. We want our team members working on your site to be in the habit of thinking about safety because it’s personally important. To themselves, to their families, to you and to everyone around us as we work. That’s why we also incorporate home safety topics in our training; we want build safety habits. Our Responsibility for Others – We want our team members to watch out for you and for each other. It’s not enough to watch out for yourself only. It’s our job to remind others who may forget to practice proper safety or make poor safety judgments. Engineered Controls – Our first line of safety on your site will be trying to find and integrate engineered controls. Similar to guards on a machine, we’ll look for ways to perform the work avoiding the risk entirely or designing systems, procedures, tools or equipment that diminishes or eliminates the risks. PPE Issued – Our team member are issued a safety bag with all necessary PPE (Personal Protective Equipment). Few of our peers can match us or even come close to providing the range and extent of PPE we do. We equip our team with the best gear and the correct gear for any environment. Team Meetings – We hold 12-15 meetings annually with ALL field team members. These meetings are held in our training room equipped for WebEx participation so traveling team members can participate regardless of where they are. We also record these meetings to share with absent team members so everyone receives the benefit of the information. Need-To-Knows – A process we use to rapidly communicate critical information to everyone. These are brief bulletins viewed and signed daily or as they occur. Enhanced Content Delivery – When and where possible, we utilize enhanced content delivery to improve the understanding and retention of the content. For instance, Toolbox Talks are delivered in a brief video format in small groups who are then required to cite 3-4 elements of what they retained. We believe enhancing the delivery increases compliance, and more importantly, the understanding and retention of content. At A&A, our safety as a team is a key factor of the A&A Difference. 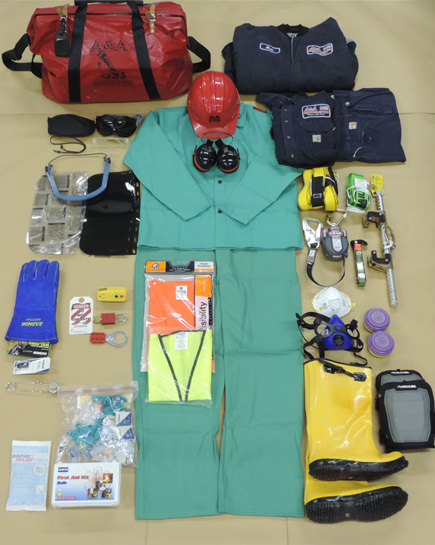 This image shows all of the PPE issued to every A&A team member available to them at all times.